Steven Hunter awarded top Driving Instructor Assessment Grade – Grade 6 – today! Every Driving Instructor has to undergo regular check tests carried out by the Driving Standards Agency. Instructors are graded 1-6 (6 being the highest). Today Steven Hunter became one of only 6% of UK driving instructors to achieve a grade 6, which means “Overall performance to a very high standard with no significant Instructional weaknesses”. Why settle for less when you can learn with the best? Call Steven today 07758 877964! Hull Driving Instructor, Steven Hunter, who has taught over 1000 people in Hull, looks back over 25 years of teaching today. All his passes, particularly the first-time passes. Helped one pupil, who had taken 14 tests with another instructor, pass on his 15th attempt. Eldest success was a 59 year old who passed their test the day before her 60th birthday. Two of Steve’s former pupils have themselves become driving instructors. Steven Hunter started as a trainee driving instructor in 1986 with Scarrotts School of Motoring. He went on to qualify as a driving instructor under their banner on 9th March 1987 and went solo 3 years later when Scarrotts ceased trading. He celebrated his 500th pass back in 2008. Steven was also in the news in November 2011 when he gave his ex school car away to pupil, James Withers. The car was a good runner with low resale value so Steve decided when he bought a new one late last year, he would offer it to the next pupil to pass their test. James was the lucky pupil. For further information about driving lessons with Steven Hunter please call 077588 77964 or visit www.stevenhunterdrivinglessons.co.uk. He is also available on Facebook and Twitter. ONE “L” OF A GIFT! Steven Hunter, who has been teaching people to drive in Hull for almost 25 years, has congratulated his pupil, James Withers, who passed his driving test this week, by giving him the school car he learned to drive in. A number of Steven’s pupils have passed their tests since he made this decision but Steven wanted the car to go to someone who didn’t already have a car of their own or a works vehicle. 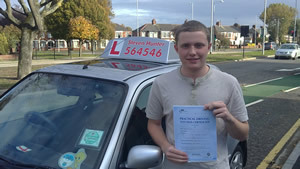 James Withers, met this criteria and passed his test, 2nd attempt, last Saturday 29 October. Steven Hunter started as a trainee driving instructor in 1987 with Scarrotts School of Motoring. He went on to qualify as a driving instructor under their banner but then went solo 3 years later when Scarrotts ceased trading. He celebrated his 500th pass back in 2008. Editors and Journalists – please contact Joanne Hunter – 07967 454075 or hunter.joanne@chixisthe.biz. PHOTO OPPORTUNITY – Steve is planning to hand the car over to James on Sunday 6 November – for more details of time location etc – please call Joanne Hunter 07967 454075.